RAWE. 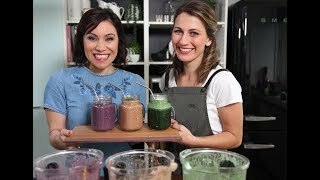 founder Maggie Gray joins Stacey in the kāuta and she's makes three yummy, organic smoothies: Chocolate Mylk with cacao, dates and cashews, Blue Nutta with bllueberries and peanut butter, and a Greena Colada with pineapple, coconut water and leafy greens. Yum! For more on Maggie and RAWE., check out rawe.co.nz or follow her at Facebook and Instagram.